On the far tip of the enormous continent of Africa, lie the countries of which we are going to speak about. South Africa lies at its very southern tip, Zimbabwe, which used to be called Rhodesia is to its north, and Namibia, which was called South West Africa, to its north west. Between Namibia and Zimbabwe, lies Botswana, a country which is known for its Kalahari desert. Then to the east of Zimbabwe, lying on the Indian Ocean, we find Mozambique. A country that also needs mentioning is Zambia which lies to the north of Zimbabwe. To European standards, these countries are very big. The whole of Europe will fit three or four times in the countries mentioned. Yet their total population does not even reach closely to the total population of Europe. Nor, for that matter, does its history reach so far back. While most of Africa is veiled in historical darkness, it is expedient that we speak a little of the Catholic origins in these areas. The history of the Catholic Church in Southern Africa goes back to the arrival of Bartholemew Diaz (a Portuguese sailor) at Walvis Bay, (in modern day Namibia), 8 December 1487. He called it the gulf of Santa Maria de Conceicao. 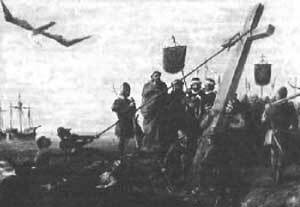 The first Mass, said perhaps in late December 1487 or early January 1488 was celebrated on the island of the Holy Cross (Named as such by Diaz) just off modern day Port Elizabeth (South Africa). Ten years later Vasco da Gama, on his way to India, would, on Christmas day sight the land to which he gave the name “Tierra de Natal” (today called KwaZulu Natal). These explorers also brought missionaries with them and even though they remained in the Cape area (Southern tip of South Africa) they also evangelised Angola, Mozambique, and to a lesser degree Zimbabwe too. With the arrival of the Dutch in April 1652 things changed completely. How different to the arrival of the Portuguese 150 years earlier. They had been given orders by the Portuguese King John II to “first spread the Christian faith and secondly to gain the riches of the East”. With the Dutch, however, all Catholic priests were excluded with a religious intolerance and not even Catholic settlers were allowed there. In 1660 a French bishop, wrecked at Table Bay was forbidden to say Mass. Such was the situation up to and including 1795 when the British occupied Cape Town. In 1802 the Dutch regained control of the Cape and on 25 July 1804 the Dutch Commissioner General published an ordinance promising religious toleration. 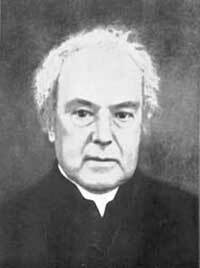 At once three priests arrived from Holland, one of them, Fr Joannes Lansink was appointed Prefect Apostolic in 1805. However, Cape Town fell to the British in 1806 and the British governor lost no time in expelling the three priests who had so recently arrived. The first Prefect Apostolic of the Cape died at sea on his way home. In 1814 an attempt was made to find a successor to Fr Lansink. Thus it was that Pope Pius VII appointed the Benedictine Dom Edward Bede Slater as the first Vicar Apostolic of the Cape (18-8-1832). He never set foot on South African soil as the Government in London forbade him to go there, so he went to the island of Mauritius (Indian Ocean) where he was first Vicar Apostolic here too. His successor, Dom William Placid Morris resided too in Mauritius, never putting foot on South African soil. With the appointment of Bishop Raymond Griffith O.P. as third Vicar Apostolic of the Cape in 1837, the history of the Catholic Church as a visible institution in South Africa began. Missionaries (few in number) evangelised all of the Western Cape and then the Eastern Cape became a Vicariate with Bishop Aiden Devereux and his successor Bishop Ricards residing in Grahamstown, (later transferred to Port Elizabeth). In 1852 the Oblates of Mary Immaculate (OMI), founded by St Eugene de Mazenod, arrived in the Natal area, with Bishop Allard as first Vicar Apostolic of the large area from the East coast to Bechuanaland, (now Botswana) and up to modern day Zimbabwe. Zimbabwe would become the Zambesi Mission which was given to the English Jesuits. In 1880 the Trappists with Abbot Franz Pfanner would arrive, first at Dunbrody, then settling at Mariannhill. At the time it was the largest Trappist Monastery in the world. During this same time, missionaries landed off the coast of Namibia, the land of vast deserts. These were mainly OMI’s. They would travel far and wide, establishing many missions in the north, close to the borders of Angola. Many died due to the harsh conditions. These are the beginnings of the Catholic Church in Southern Africa. For the next sixty or seventy years the Church grew rapidly, making many converts among the many different black tribes. Generally, the blacks were very superstitious. Witchcraft and ancestor worship formed part of their everyday life. Very few, however, were the converts among the white settlers who were seeped in their Calvinistic ideas. An incredibly fast decline in the new-born faith of the Africans came about with the advent of the Second Vatican Council. Conversions came to a halt and many turned back again to witchcraft and ancestor worship. Liberation Theology was one of the main effects in Africa of the Council. A Theology, if one can call it so, which done untold damage. Fr. Gregory Zier is often spoken as the father of Tradition in Southern Africa. He was of German descent and had come to South Africa after the first world war. He had set his heart upon the conversion of witchdoctors among the Zulu tribe. He worked in close collaboration with the Marrianhill fathers in Natal. He always however remained a secular priest. How many witchdoctors did he convert? His great humility never allowed him to reveal any numbers. Nevertheless, he was known far and wide for his powers of exorcism. From all over, many would daily come and see him to ask him for deliverance. Perhaps it looked funny to Westerners when they found him in his little hut, the walls of which were covered with witchcraft paraphernalia. Why did he do so? Why did he require these objects from those whom he exorcised? He knew the blacks and their superstition. They had an enormous fear of these objects; bones, pins, feathers, carved pieces of wood, etc. Adorning the walls of his hut with these things, showed the people not only that he had no fear of them, but that his powers of the Holy Priesthood were far superior. This caused them to have an even greater respect for him. One little amusing story of his work is well to be mentioned. The Zulus have an immense fear of snakes. These animals are for them somewhat akin to evil creatures. One day, Fr. Gregory found a rather large snake. It was, however, already late. He wanted to keep it for the next day to show the Zulus that he had no fear of this “diabolical” creature. How was he to keep it until the next day? He had an idea. He slipped a large golden brass ring around the snake and tied it herewith, by means of a string to the post. Unfortunately, the next morning the snake was gone. The string was broken. It was not long after when a very great consternation broke out in the nearby village. They came to call him in great haste: “Father, you must come quickly, the people have called together all the Witchdoctors. The gods are speaking to us, they say, and something very bad is going to happen to us. Many people have seen a snake with a golden ring around its belly!” Poor Fr. Gregory! That one he lost! But now, let us pass on to the present crises in the Church. Fr. Gregory never offered the New Mass. He refused! For this too, he very soon became known. Nevertheless, the news of his refusal filtered through to the people rather slowly. Perhaps it was due to the fact that there were many who believed as he did. Other priests slowly began to say the New Mass. Many people were in bewilderment. celebrate the true Mass for them. Interestingly enough, it was mainly the Whites that began this refusal of the New Mass. Although it must be said that, in general, the Blacks did not like the New Mass, they never stood up to fight against it. Only one Black priest was bold enough to do it; Fr. Marcus, a Zulu priest. Very soon Fr. Gregory was asked to come up even to the north of South Africa. Well into his seventies already, Fr. Gregory must have foreseen the need of younger priests. He must have understood the widespread corruption among his fellow priests in Southern Africa because he urged his little flock to turn to no other excepting Archbishop Lefebvre in Switzerland. was a time of great consternation and trial for many. Even their way of life had to change. Television was condemned … they had never heard such straight and clear teachings. Some understood. Others believed that this young priest was just full of himself. Others thought he was crazy! doctor even before he became a priest, and he also inherited a small farm far out to the eastern boundaries of South Africa. There he decided to use his medical profession to look after the poor. For nine years, every morning he would offer the Holy Mass all alone. Thus it was that in 1978 he was discovered and agreed to come out and serve the people one Sunday every two months. With this promise the group of “Halfway house” was started. Halfway house was an area between Pretoria and Johannesburg. There were a number of people from both cities who would come. One hour of travel was certainly for those who lived the closest. And so this little group, about 30 in number, began to be more and more united. Also in Natal, under the continuing care of Fr. Gregory the group fortified. Other groups also began to form very quickly: Port Elizabeth, Cape Town, Bulawayo and Salsbury (now Harare), the last two both in Zimbabwe, and then even in South West Africa (now Namibia). Fr. Williamson also continued his visits every year, 1979 to 1983. His main purpose was to preach the spiritual exercises of St. Ignatius of Loyola. His argument was that a solid core of faithful had to be formed to hold out for the future. This he endeavoured to do by the preaching of the spiritual exercises. His judgement on this proved to be accurate. Many many years later, even to the present day, this core still exists and was, in fact, the corner-stone upon which the Society of St. Pius X in Southern Africa would build its apostolate. 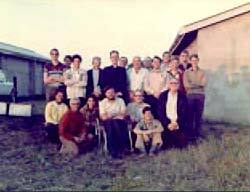 In 1981 Southern Africa was graced with the visit of Archbishop Lefebvre. A few other priests also came to understand more profoundly the problems in the Church, and they too then helped these small groups. These were Fr. Beddingveld in his mission among the Zulus, Fr. Leslie from the Durban diocese, Fr. Ranger from the Port Elizabeth diocese, Fr. Cosgrove from Cape Town. During this period, many young men went to Ecône to see if God was calling them to the priesthood. Some went through to the priesthood, while others returned. 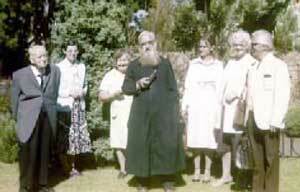 Finally in 1984, the first priest of the Society of St. Pius X was sent to establish a priory in Johannesburg. This was Fr. Delsorte. He was helped by Fr.Leslie for some months after which the second Society priest came, Fr. C. Hahnchen, from Germany. Then came Fr. Frank Peek, from New Zealand, who was to help since the district was too vast for only two priests. Already they were receiving requests to come to Zimbabwe and to Namibia. This they did and found scattered groups of lost sheep everywhere. Fr. Reinartz, from Germany, came in August of 1987. 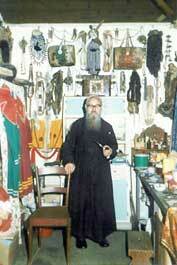 Without mentioning other priests who came and went, it was finally in August, 1989 that Fr. Gerspacher, from Canada, arrived as Superior of the autonomous region of southern Africa. He began the Society bulletin for southern Africa, which, a little later would acquired the name: “Nova et Vetera”. Another important event in southern Africa, which strengthened the traditional movement and shook the modernists, was the priestly ordination in Johannesburg of two young men in 1989. Other forms of the apostolate also rapidly spread; particularly the Eucharist Crusade for the children, the third Order of the Society of St. Pius X. Recently the St. Andrews Society for girls (S AS) has also been introduced. 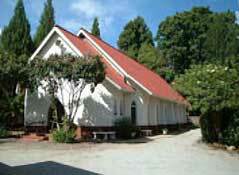 In the 1 990s, many advancements were made in the form of the building of chapels. Thus in 1991 the original small chapel in Johannesburg was sold in order to buy a much larger property on the outskirts of Johannesburg, Roodepoort. Here also a small school was founded which is still running today. Thanks to a Holy Ghost Brother, by the name of Br. Vincent, who came to help the Society in 1986, many buildings were erected or old ones renovated. The property in Roodepoort was an old school, which now serves as a very beautiful priory. Port Elizabeth chapel was a rather ugly shop, which is now the pride of that little group. Cape Town chapel was an old Post Office, and is now a beautiful little chapel. In Omaruru, Namibia, the Society was able to buy an old run­down chapel, built by the OMIs in 1907. This too was completely renovated. But, chapels also had to be closed down. For example, priests used to go into Soweto, a rather dangerous township, to administer the sacraments to a group of about 20 Zulus. It was already planned to close this mission and help the people to come to the priory of Roodepoort. Nevertheless, before its actual closure, one of the priests, having brought the sacraments to a sick lady, was upon returning to his car, held up at gun-point to hand over the keys. He could not do otherwise. The thieves spared his life but took off with the car. It was never found. Speaking of crime, its rate has escalated to a phenomenal degree. The little pick-up truck owned by the Roodepoort chapel has had 12 attempts of theft. Our chapels have to be surrounded with high fences and even by vicious dogs. Often our faithful fall victim to thefts. As a result, to help them we are obliged to conjure up all kinds of security systems, from coded gates to ticket systems. At the present, there are seven Society priests working in southern Africa. Two are based in Harare, Zimbabwe, three in Roodepoort, Johannesburg, and two in Durban. One Society Brother and the Holy Ghost Brother mentioned before. Two oblates help at the priory in Roodepoort. From these three centres all the other chapels are visited. 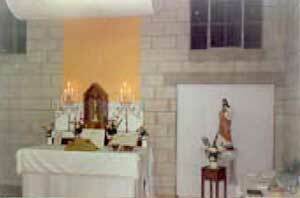 There are also a few very small chapels that may have a priest when possible. 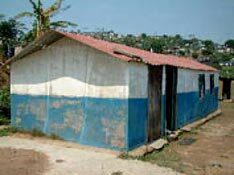 Such is the tin-shack chapel of Umlazi, close to Durban. 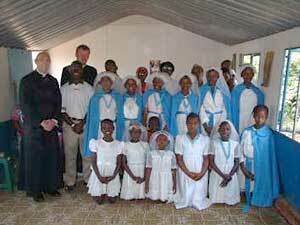 Southern Africa speaks today of 23 traditional vocations in the Religious life. Recently contact was made with people in Zambia, who have been crying for a priest for a long time. This mission remains very difficult because the closest airport is 1000km away. Yet it is wonderful to see how these people are keeping the faith and persevering in the love of God. La Reunion, a French island in the Indian Ocean has also been visited a number of times by the priests of southern Africa. The trip is four hours by plane if a direct flight can be obtained. Otherwise the priests are often bound to fly through the island of Mauritius which adds another two or three hours upon the trip. The main language grouping of Catholics is among the English-speaking people as the Afrikaners have seldom converted to Catholicism and the Catholic Church is still known as the “Roman danger” (Romse gevaar). Hence the greater number of people are English-speaking except for Namibia where they speak German. 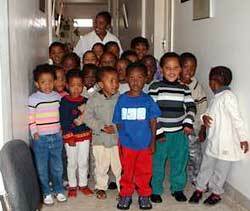 A number of black Africans come to our chapels notably in Roodepoort (about 20) and in Durban (about 80). Many of these speak English but their mother tongue for the most part is Zulu. In Zimbabwe the number of black-Africans have grown to about 100. Many of these do not speak English since their mother tongue is Shona. This is perhaps the greatest night-mare for a missionary; there are no less than 700 black languages in Africa, and that’s not counting the dialects. The number of faithful has increased gradually but steadily over the years. From the first handful, then 20 and 50 in the garages converted to a chapel or the scout halls, to about 250 at Roodepoort, 180 in Durban, 220 in Zimbabwe, Port Elizabeth 40, and Cape Town 50. Over the years the greatest loss of faithful has come from the departure of many families to other countries. So that as many as 25 families have settled in other parts of the world, fearing for their futures in the changing social and economic conditions of southern Africa. More are still to leave according to the opportunities which are available. This tendency will unfortunately continue to leave us with minimal growth, although providence has seen to provide the chapels with new faithful to offset those we have lost. The interaction of the races in southern Africa has been highlighted considerably over the years world-wide. In a much misunderstood area the relation between the often different cultures can sometimes lead to amusing happenings. One such took place when the community went together to Harare to St. Joseph’s Priory, a trip of 1000km. in order to assist at the ordination of the then deacon Rev. Mr. Justin Swanton. The house servant, a former seminarian, was left to look after the Priory house. Off we set and reached Harare without incident, and the ordination was duly conferred with a splendid celebration following organised by the Prior Fr. Craig Bufe. We who had driven up would stay till after Sunday while Fr. Reinartz would fly back to Johannesburg to celebrate the Sunday Masses. All went well and Fr. Reinartz arrived at the Priory only to find that it had been more or less taken over by a number of the house servant’s friends. Needless to say this state of affairs could not be allowed to continue and the friends would have to leave. All would have ended happily if one of them would not have been found to be at that very moment quite happily sleeping in Fr. Reinartz’s bed. Without too many words the whole lot were given the order to leave and with them our faithful servant. Due to the rapidly decaying financial and social structure in southern Africa, our apostolate is obliged to extend to the needy. Daily there are more and more without work and so hunger follows closely. It is now no longer an uncommon site to see up to 30 or 40 beggars at our gates, begging for food or clothing. We cannot, in the charity of Christ, send these beggars away empty handed. It is not only the cost involved, but also the work. The oblates in Roodepoort now have a system. When the red flag hangs out by the window, there will be no distribution of food. As soon as the green flag is hoisted, then they may come, … and they do! In Zimbabwe the situation is similar, excepting that the famine has grown to a much greater degree. It must here be added; thanks to many donations from all over the world, this corporal act of mercy can be continued. It is very hard to say what will happen in the future. As it is in all over the world, the Society in southern Africa can only try, with the help of the grace of God, to safeguard the faith. The next generation, to which we are bound to hand on the faith, will be obliged to continue the battle. In all our chapels, put together, we may have as few as 100 children. The world, however, is an immense attraction for these young and tender souls. We lose many children. The moment they reach 16 or 17, they abandon Our Lord Jesus Christ and give themselves to the world. Please pray for souls, especially these young ones, that they may keep the faith, persevere in the love and service of Our Lord Jesus Christ, and in this way save their souls and many others also.